APPROX. 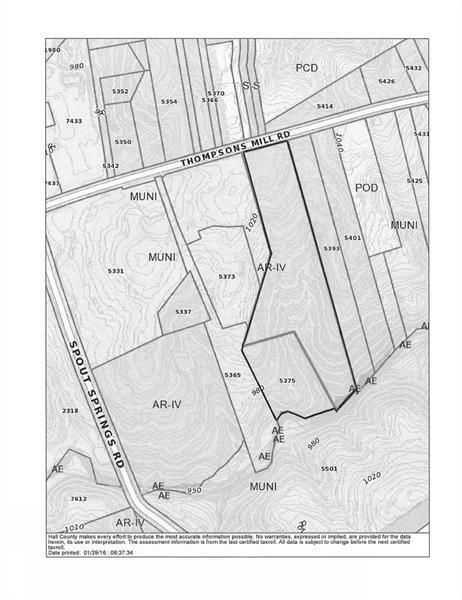 19.19 ACRES WITH 310 FEET FRONTAGE ON THOMPSON MILL ROAD. THIS PROPERTY IS NEXT TO CHATEAU ELAN, DUNCAN'S CORNER, DEL WEBB, GRAND REUNION AND A HOST OF HIGH QUALITY COMMERCIAL AND RESIDENTIAL DEVELOPEMENTS. AN ADDITIONAL APPROXIMATELY 10.7 ACRES OF LAND CAN BE PURCHASED AS WELL.